When a natural disaster strikes, it hits us in our core. We find ourselves vulnerable to Mother Nature, our infrastructure (power, levies, government/charitable assistance etc. ), looters and criminals, and the unknown. You may have never considered getting a firearm, but now feel open to the idea. Your story is mine. As I said in a previous article I was a fervent anti-gunner, who spent many years making arguments in support of gun control. My husband enjoyed shooting, but understood the fears I had of having a gun around our three children. We talked about getting a gun after 9/11, but Hurricane Katrina is what opened my mind. I saw a modern American city debilitated overnight with no infrastructure or security. I saw mothers begging for strangers to take their children to safety, while armed criminals took to the streets to steal what they could. I began casually storing food and water so that if my city experienced a disaster my family would be okay for a few days until things calmed down. My husband was concerned that he would have no means to protect us or keep looters from taking what we stored, and I began to consider a gun (for him to use) that would be locked away in a safe to be used only in an emergency. I finally felt ready to purchase our first firearm. There are many reasons that spur someone into gun ownership. For me it was to protect my family if we were threatened. I realized that I could not wait for a Good Samaritan or first responder to help us. I could not trust “good luck” to protect us. I wanted to learn how to prepare for different scenarios and take responsibility for my personal security. I was motivated to seek empowerment and firearms training because I wanted us to have a fighting chance in the worst circumstances. 1. Stay safe. Don’t run out and buy a gun believing that simply having it will make you safe. With gun ownership comes a great responsibility and you need to understand gun safety and the laws of lethal force. Create a Family Emergency Plan, and establish communication strategies and disaster procedures with your family. Identify the self-defense tools that you already have available to you, and incorporate your new firearm as you acquire training and proficiency. 2. Identify your fears. A Girl & A Gun Founder Julianna Crowder has a great video on Overcoming Gun Phobia. When I purchased my first gun, I wanted to have protection from looters and other criminals, but I was also afraid that it would be unsafe for me or my kids. I faced my fears head on. I researched storage options and found the right safe for our home. I found A Girl & A Gun and Julianna, who taught me gun safety and basic marksmanship. As I went through the process, I gained knowledge, skills, and confidence. 3. Find a good instructor. When you’re investing in yourself and your family’s safety, you want the right expert to guide you. The first step is to find a good instructor. Learn where your instructor received training and make sure that you’re getting quality and correct information. Proceed cautiously if your instructor gives you any red flags. 4. Buy your own gun. How a gun fits your hand is as personal as how a bra fits your body. Would you send someone else to buy one for you? Only you will know if the gun feels right in your hand, if you can reach the components, and if it aligns with your goals for shooting (home defense vs. concealed carry, etc.). The best advice is: try before you buy. Many ranges have rental programs where you can try out different guns, so take advantage of that time before you invest your consumer dollars in something you hate. 5. Join a community. Being able to learn in a judgement-free environment is invaluable. I was terrified at my first A Girl & A Gun Girl’s Night Out (GNO) at the range — I don’t know if I was more scared of shooting, meeting other women, or looking stupid. The experience, however, changed my life. I found resources of women who could answer my questions, offer encouragement, and endless training tips that helped me feel more empowered and confident. If you live near a local chapter of A Girl & A Gun, you can have trigger time with your new girlfriends. 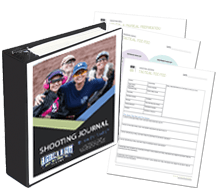 If you don’t have a chapter near you, you can join our eChapter and take advantage of many training tools, such as the Shooting Journal that works as a personal instructor and friend to guide you through educational material and over a dozen drills. You can also join the Facebook group for other eChapter members, so you have the same camaraderie and support as if they were in your own backyard. When disaster strikes, it can motivate you to buy your first gun. The good news is that gun prices are lower than they have been in a decade, so you can find the right model for your hand and needs. 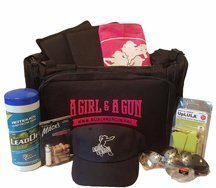 Ammunition is widely available, too, and there are more accessories and gear options for women than ever before. 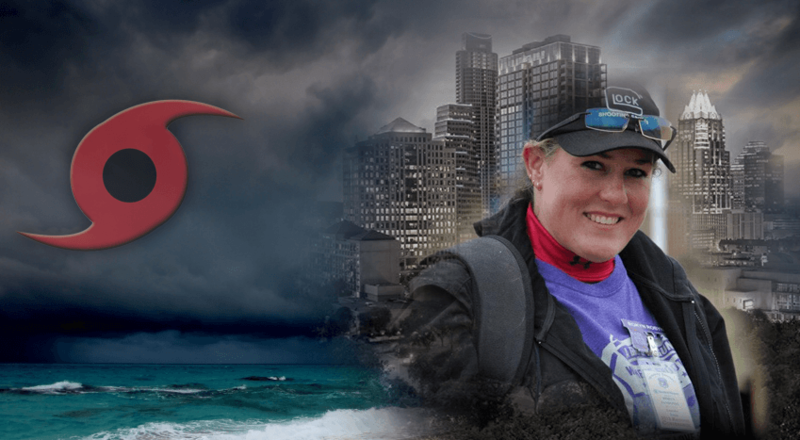 A Girl & A Gun has caring and certified instructors throughout the country, and if there is not a chapter near you, we probably have a colleague that we can recommend to help you in your journey. If you’re ever in a situation where you wished you had a firearm, it’s too late. Empower yourself now so that you can weather any storm. Well said, Robyn! I was so cautious my first time at the Range, 200 rounds later, I was addicted! I love shooting so much I got a part time job at the shooting range to support my ammo habit. It all started with wanting to protect my family and home.